FUN SUMMER GETAWAY! Awesome location! Backyard firepit. Great place to relax! Walk to the crystal clear Comal River & Tube Chute, visit Schlitterbahn Water Park (voted #1 water park in the world! ), Downtown Area with many shopping and Dining & Bar options, or just relax to all the comforts of home and quietness of small town living! Backyard renovations are complete! The outdoor living area is ready for you to enjoy! The original one car garage was made into a fabulous covered area where families and friends can enjoy great fellowship. 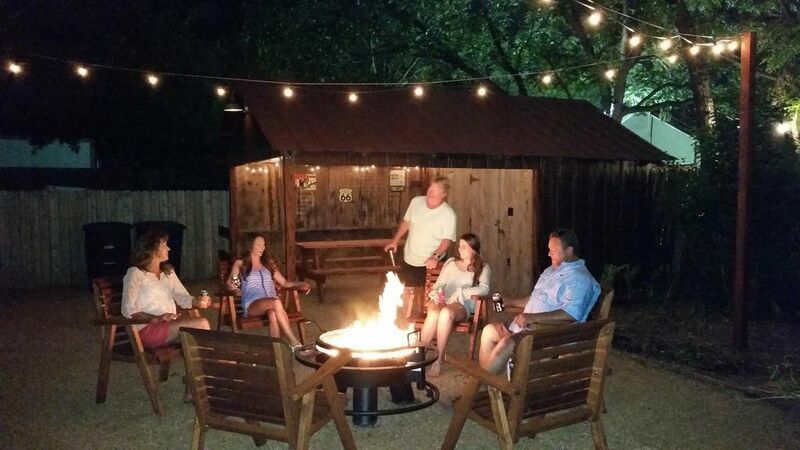 There's a Texas sized firepit to sit around and enjoy or use it to grill your steaks and burgers! Feeling a little competitive? Enjoy the washer pit installed in the backyard for some good clean fun! Covered area with picnic table, Texas sized fire pit, washer pit, and twinkly lights strung overhead....it's all waiting for you to come and enjoy. Plus the location is awesome! Located a few doors away from the 'Tube Chute' on the Comal River in downtown New Braunfels!! Home is in the historical heart of New Braunfels on an original lot deeded in the year 1845. This comfortable home features king & queen premier double pillow top beds, plus a Euro Top full size bed...all with luxurious sheets, down/feather pillows. There is a half bath off the Master and the hall bath features a large garden soaking tub with shower. A full kitchen to satisfy any cook (even on holiday), comfortable living room with two sofas and large TV, a dining area, indoor laundry room and three outdoor patios. For your convenience, the home offers dish TV in all rooms, wireless internet access, a nice selection of books and games for our guests enjoyment. Call or email us to plan your vacation and book our home. We will be happy to assist you with any local information! Be sure to read our 'unsolicited' reviews....you too can enjoy all the fun the downtown area of New Braunfels has to offer. All within walking! Usually we completely sell out during the summer, so please call soon! Winter Texans Welcome!! : Due to our mild Texas climate...Fall and Winter are both wonderful months to visit and explore New Braunfels, PLUS the surrounding areas & towns. During the Holiday Season, there are countless activities, festivals and events to attend. There is fun to be had by all ages from Movies In The Park, two local Theatres featuring excellent plays by local artists, numerous musical venues, superb dining, beautiful parks, walk & bike trails, good golf and so much more! One visit to New Braunfels and you too will see why everyone keeps coming back...year round!! Day Trips To.....: Wimberley, Fredericksburg, Kerrville, Comfort, San Antonio, Austin, Marble Falls and all over the Hill Country are right at your back door! Not to mention the local favorite of Gruene (pronounced 'Green') home to the oldest dance hall in Texas and venue for numerous motion pictures! If shopping is your bag.....one of the nation's largest designer outlet malls is but 20 minutes away this side of San Marcos!! Two spacious bathrooms. Both have marble vanities and toilets. The full bath features a large Garden tub with shower. Located a little over a block from the downtown circle...close to restaurants, bars, shopping, parks, Wurstfest, and the Historic Walking Tour! Books available during your stay, but not for keeps!! Very minimal so bring your own! Lighted washer pit for your outdoor enjoyment. Large back patio seats six and small side deck seats two. Original antique garage has been turned into another gathering place with picnic table, string lights, ceiling fan and insulated beverage box. In order to preserve the integrity of the home for you, and future guests, no more than 6 guests in a party. All guests in a party must be 25 years or older, unless accompanied by parents. Great location with all the comforts of home! We stayed here 4 weeks, leaving Saturday, March 30. This is a great location. You can easily walk to all the downtown venues, to the tube chute on the river, to Landa Park, and more. The neighborhood was quiet as the home is not on a through street. This home is nicely renovated and decorated, the kitchen is stocked with all dishes and utensils, the master bedroom has a king bed, and there is a large second bedroom we didn't need or use. Having a full bath and a half-bath added to the convenience. The furnace worked great early in the month when temperatures outside fell below 40 and the A/C worked great late in the month when we saw 80-85 degrees a few times. Ceiling fans in all the rooms kept it comfortable for all the days in between. We enjoyed sitting on the front porch some evenings and in the back yard other evenings. The owners communicated well and responded quickly to any questions we had. We highly recommend this rental, especially for an extended stay. Wonderful house and outdoor area! Great house and great location. Lisa was very helpful with check in and suggestions for food. We would definitely stay there again. Our family stays here every year for Wurstfest! Great place and close to all the places we like to go in New Braunfels. Every thing you need for a family vacation right here. We love having you stay with us every year. I get excited when I see that reservation request come through. Hope to have you back this Summer, but if not I look forward to next year! That is what we love to hear! So glad you enjoyed your stay with us. Come back soon. This is a great house with an amazing backyard. The location is fantastic. Everything is within a 5 minute drive or you can also walk. The kitchen was stocked with anything you could need including coffee. The beds were super comfy and there were plenty of extra pillows and blankets. Did I mention the great backyard? It’s excellent for hanging out and grilling! This will be our go to anytime we want to float the river or visit Schlitterbahn. This is the perfect house for a family get away. Short drive to anything and everything you need. The backyard is perfect for unwinding after a busy day. We stayed with our three daughters and it was the perfect size. We contacted the owner and they were very attentive and responded quickly. We will be back! Thanks again for a wonderful stay! New Braunfels is conveniently located between San Antonio and Austin, at the edge of the Hill Country. Our town is known for several attractions: Our Rivers!! (the Comal and the Guadalupe) which offer endless water fun and relaxation; Schlitterbahn Water Park (voted #1 in the world); our quaint downtown district with restaurants, shops and bars; and just on the outskirts of New Braunfels is the town of Gruene with its restaurants, shopping and the infamous Gruene Hall (oldest dance hall in Texas). Another attraction for visitors is the outlet mall in San Marcos, one of the best in the country. We also have the Dry Comal Creek Winery, Natural Bridge Caverns & Wildlife Park and Canyon Lake nearby. New Braunfels is a relaxing tourist destination for all ages and lifestyles!! Golf: We have two local golf courses. One is the Landa Park Golf Course along the banks of the Comal River, just a stones throw from home. There is a second course located outside of town along the Guadalupe River at the Bandit (FM725). Cart and club rentals are available at both. Ski: Boat rentals and water skiing available at nearby Canyon Lake and Lake McQueeney. Great downtown property and walking distance to restaurants, shopping, bars, bakeries, etc. Holidays require 3 night minimum.